Can The Great Gatsby Make 3D Seem Sophisticated? Literary classic The Great Gatsby is not a twisted work of science fiction. It's not an epic fantasy full of made-up creatures, or a gory horror tale designed to scare the crap out of you. 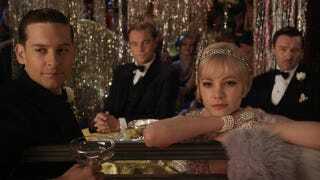 But like recent sci-fi, fantasy and horror movies, the new Great Gatsby film will be in 3D. And director Baz Luhrmann thinks it makes perfect sense. Luhrmann tells the New York Times that his intention is not to create a special effects flick: "The 'special effect' in this movie is seeing fine actors in the prime of their acting careers tearing each other apart." He specifically references an intense scene between Gatsby and Tom Buchanan in a hotel: "How do you make it feel like you're inside the room?" If "The Great Gatsby" succeeds, it may open the door to a new generation of sophisticated movie dramas that will match the spectacle value of the animations ("Happy Feet Two"), action films ("Underworld: Awakening") and elaborate fables ("Hugo," "The Adventures of Tintin") that now fill Hollywood's 3-D release schedule. Sophisticated dramas! In 3D! Somehow it seems strange to imagine heading to the theater, slipping on those plastic glasses and settling in for a "serious" film — like Schindler's List, Casablanca, or House of Sand and Fog — in comin'-at-ya visuals. That said, Baz Luhrmann has a strong visual style and is known for creating spectacles — Moulin Rouge, Romeo + Juliet — and since much of Gatsby is about opulence, parties, and the accoutrements of the rich, 3D could help immerse the audience in the spirit on the Fitzgerald work. Honestly, though, if there's a 3D version of that iconic shirt scene, folks just might burst out laughing.